Heralded as a ‘Breakthrough in Corporate Protection’ it aims to eliminate risks related to compliance issues, leaking of sensitive information, legal exposure, brand damage, and so on. 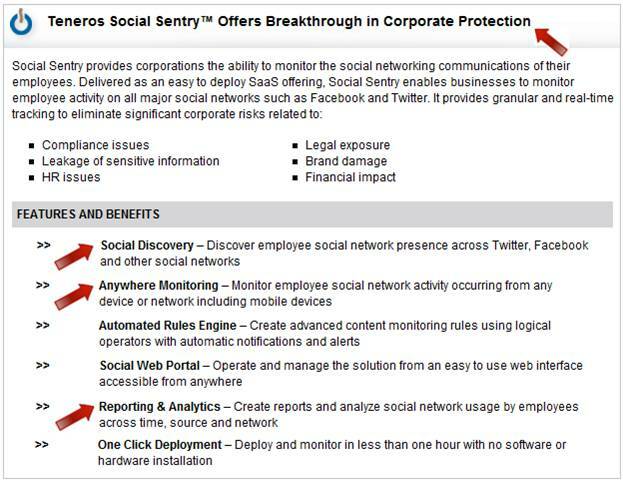 Social Sentry will notify an employer whenever a worker publicly posts something to Facebook or Twitter, and it will soon add the ability to monitor employees use of YouTube, MySpace and LinkedIn – whether or not the post occurs from the office. We can all understand corporate concerns about productivity, and choosing to install a policy against employees blogging, browsing or socializing online while at work. We understand companies wanting to ensure that their secrets aren’t exposed. In fact, the service, and others like it, sound like motherhood and apple pie until you look at the other side of the coin. “It’s an employer’s legal right to monitor any public information related to an employee…You definitely want to take advantage of your legal right to monitor” says Nancy Flynn, executive director of the ePolicy Institute an organization that advises businesses on online policies. It is going too far when employers claim the right monitor every public piece of information related to you or posted by you. If you aren’t Tweeting, blogging, networking or shopping from your workplace, your employer shouldn’t be tracking you. Today, many types of information that are illegal for employers to ask about are now actively being searched for online. For example, your political affiliations if you donate to a political or activist campaign can be reported to your manager – who may have a different point of view. Information about your health if you join a website that helps you manage diabetes, or one that supports women trying to get pregnant can be reported – information that can impact whether you get that new position, or are among those let go. Though for many people it is possible to find this information online, it is none of your employer’s business. Just how concerned you should be was highlighted in research commissioned by Microsoft in December 2009 titled Online Reputation in a Connected World that examined how recruiters and HR professionals use online reputational information in their candidate review processes. The research found that 79% of U.S. hiring managers and job recruiters surveyed consistently reviewed online information about job applicants, and that 75% of surveyed companies have formal policies in place that require hiring managers to research applicants online. 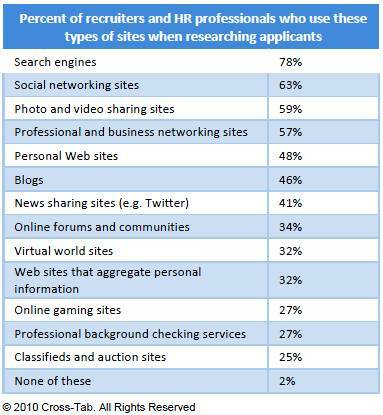 While it isn’t surprising that recruiters use search engines, you may be less comfortable about searches on your photo sharing sites, personal websites, gaming sites, forums, and purchasing/selling sites, or on government sites that show voter records, criminal records, etc. The information acquisition by recruiters isn’t limited to what you post, information posted about you by others can also do you in. Microsoft’s research found that information that influenced recruiting managers included, concerns about a candidate’s lifestyle, inappropriate comments, videos or information posted by either the candidate or someone else about the candidate, and concerns about a candidates financial background. With products like Social Sentry, this level of invasive searching is now not merely at the point of hiring, it represents an ongoing probe into aspects of your life that companies previously had no ability to access – and were banned by law from asking. Just how far a company can go in e-monitoring was challenged by a woman who’s private email was read by her company. Many companies have a policy that all e-mail written on company computers is under the ownership of the company, which they can read at any time. But in a legal case decided earlier this month, New Jersey Supreme Court ruled that an employee should have an expectation of e-mail privacy and confidentiality when using a personal Webmail account, not the company’s email system. The likely outcome of this ruling will be changes to corporate privacy clauses, to specifically give them the right to accessing any email – whether sent or accessed on corporate or personal accounts – if the company’s computer or network was used to access it. At this point, employees have few options. The reality is that information which was (and still is) illegal to ask employees to provide, is now researched online legally. Your choice is how much information is publicly disclosed about you online. Use an alias for any websites, forums, discussions etc. you join that have anything to do with your health, the health of a family member, your political views, your faith, any auction or seller’s sites, etc. Keep in mind that even if you use your own phone or laptop to post information online, your employer will still see the time it was uploaded – and if that was during work hours. Request that your friends and family keep any information, photos, etc. of you private – and frequently use a search engine to find what information has been posted about you. The better you protect your privacy, the less you invite unwanted intrusions by employers into your personal life. This entry was posted on Monday, April 12th, 2010 at 8:55 pm and is filed under Linda's Blog. You can follow any responses to this entry through the RSS 2.0 feed. Both comments and pings are currently closed.